Retaliatory tariffs caused a sharp downturn in American whisky exports in the last half of 2018 as distillers started feeling the pain from global trade disputes, an industry trade group said Tuesday. Exports to some key overseas markets gyrated wildly last year for producers of bourbon, Tennessee whisky and rye whisky. Overall, U.S. spirits exports in 2018 stayed on another record-setting trajectory, due in part to surging whisky sales in the months leading up to the tariffs as larger distillers stockpiled supplies, the Distilled Spirits Council said. Other categories including vodka, brandy and rum also had strong overseas sales. The export figures confirmed fears among industry leaders that tariffs would depress overseas sales. But whisky industry officials have been muted in blaming President Donald Trump and others for the export headaches. American whisky exports to the European Union — the industry's biggest export market — fell by 8.7 per cent from July through November of last year, compared to the same period in 2017, the group said in its annual report released in New York. In the first half of 2018, American whisky exports to the EU surged by 33 per cent, it said. Overall global American whisky exports grew by 28 per cent in the first half of 2018, then fell by 8.2 per cent from July to November — compared to a year ago — once tariffs took effect, according to the trade group's export figures, based on numbers supplied by the U.S. government. American whisky makers face retaliatory tariffs in Canada, Mexico, China and Turkey as well as the EU. Those duties amount to a tax, which producers can either pass along to customers through higher prices or absorb shrinking profits. Catoctin Creek Distillery in Virginia has a couple hundred cases of its rye whisky sitting in a European warehouse. The inventory was built up in anticipation of growing European sales in 2018. 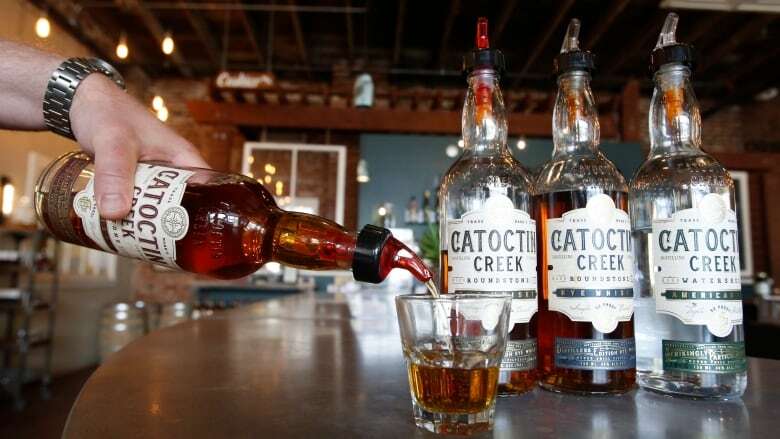 But since the tariffs took effect, Catoctin Creek's sales in Italy and Germany have plunged and its plans of expanding to the United Kingdom are on hold, said its co-founder and general manager, Scott Harris. Combined U.S. revenues for bourbon, Tennessee whiskey and rye whisky rose 6.6 per cent, or $224 million, to $3.6 billion in 2018, council said. Domestic volumes rose 5.9 per cent to 24.5 million cases.